Editor’s Note: This post is part of the Stat of the Month series with Oracle Marketing Cloud. Content marketers like to think we are important. We’ve changed the face of modern marketing, haven’t we? We create the content that drives awareness, builds relationships with prospects, and helps move them along their path to purchase. Well, according to a study of marketing technology buyers by Walker Sands, we have a lot less influence than we might think. Let’s start at the top. What’s New in Marketing Technology? Where do buyers learn about new marketing technology? The top answers in the study are peers and colleagues (30%), news publications and blogs (20%), and search engines (13%). In a study like this, marketers should be looking for the term “vendor” in the answers. That’s how their marketing shows up. Not only is it not at the top of this list, but it’s not anywhere on the list. Way at the bottom of the list are sales reps. Wait, you mean buyers are still finding out about new solutions from sales reps, and not marketers? Maybe there’s something to this whole relationship building thing after all. Nothing created by us content marketers is credited with helping buyers discover new technology. But if you look closely at the top answers, there may be more to it than you think. All three of the top answers are influenced by content created, published, and shared by content marketers to varying degrees. This means your content is not connecting directly with buyers above the level of awareness. Remember, though, that content marketing is not about your products or solutions, but about providing value to prospects in solving their business problems. If your content is truly serving that function, you would not expect it to show up as a source for new marketing technology. From a content marketing perspective, let’s focus on a few points. First, don’t get hung up on the fact that both the company website and the company blog were lumped into the same category. Use that to your advantage, and make sure there are clear connections between appropriate sections of the blog and the website. 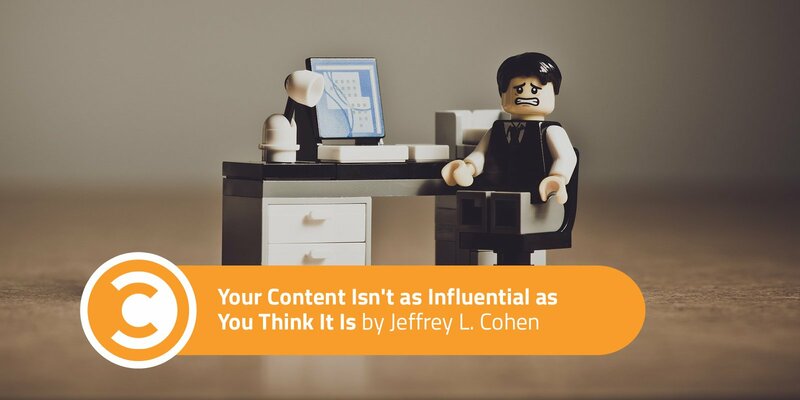 This phase really is the heart of content marketing. This is when you are driving awareness and earning trust by providing educational content. The research phase is where awareness happens. While the buyers may have heard of your company, this is when they start to understand your approach not just to marketing, but to prospects and customers in general. Since all the sources of vendor content have the same influence at this stage, why not look at them as equal partners? The products details—what are often called feeds and speeds—are still important as buyers look to understand what your are offering. But the more general content on your blog and in ebooks and white papers are the things that form the bonds of the relationship. Finally, the study looked at what sources were most influential in making a purchase decision. It is no surprise that your content does not provide much at this point in the process. Only 5% of MarTech buyers choose blogs in this stage. Again, if you are doing your job as a content marketer, this is not surprising. Corporate blog posts are not about products. They should not be influencing the final purchase decision. But note that 36% cite the website as most influential. This is another indication that strong connections should exist between your content marketing efforts and your product pages on the website. As an example, we have three different connection points to link our blog posts, product pages, and resources about marketing automation. In addition to having a call to action to a single relevant resource guide, like our lead scoring guide, our blog posts also have a link to our marketing automation resource page that offers a huge variety of content. The educational resources also appear on our product pages, so prospects can learn about the topic as they explore our offerings. We are able to track all of their activity in this process. This is one way that we support multi-step paths directed by customers, rather than pre-defined journeys. And what was the most influential in the buying stage? Product demos. No matter how much trust you build and how strong of a relationship you create with the buyer through a variety of content, the product still has to serve their needs.